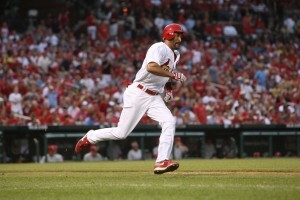 Carpenter pitched eight innings and the Cardinals got home runs from Randy Winn and Matt Holliday in winning their seventh in a row with a 7-1 win over the Philadelphia Phillies on Tuesday night at Busch Stadium. 47 year old Jamie Moyer was hurt in the first inning, while Carpenter went five separate innings of throwing fewer than 10 pitches. Carpenter got plenty of offensive support with the long ball again. In the third, Randy Winn homered with Felipe Lopez on base to give the Cardinals a 2-0 lead. That came off the Phillies’ pen after Jamie Moyer, the 47 year old left after one inning with a strained elbow. In the fifth, Chris Carpenter hit a three run shot off Danys Baez, his 16th of the year to make it 6-0. The lead in the central remains a half game on Cincinnati who won over Washington.